Christmas is just around the corner and how are your preparations going, friends ? Wishing all a Merry Christmas in advance !!! Here Christmas vacations are starting from today for kids and they are super excited. We are leaving tomorrow to our native place and so will be away from this space for a week. I know many might be visiting parents and relatives from far and near and it's a great time of the year to get together followed by New year celebrations. How quick is the clock moving, ryt ? Its just like a blink of an eye and a school year comes to an end and that's life. 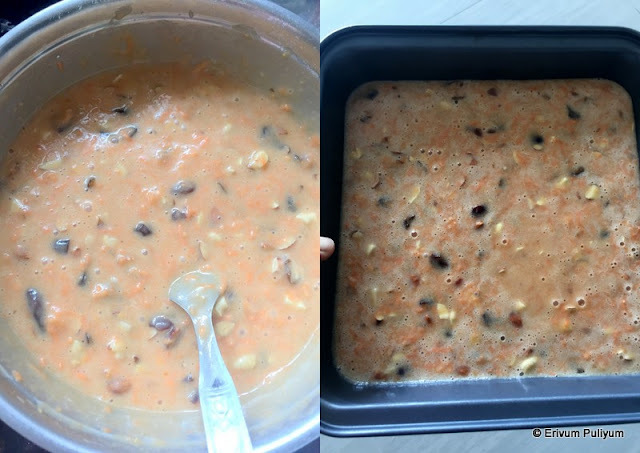 And before the last minute preparations, if you haven't soaked dry fruits and nuts for making Kerala plum cake then this cake is a great alternative. We aren't celebrating Christmas this year as H's dad passed away early this year. Time heals everything but the very feeling of a dearest does make a difference when it comes to esp celebrations. Last year he was with us for Christmas and that very feeling doesn't invite a celebration mood. Kids don't understand these feelings much and for them Christmas is cake time, Santa gifts and much more. For their sake, I made plum cake to enjoy. However, wine preparations took a back seat this year and so do the other preparations other than cake.Coming back to today's post this cake is a pudding type cake that is sticky at the top and moist inside. I have already posted a carrot cake recipe earlier but this cake is entirely different from that cake in tastes and texture. These days this pudding cakes are on sale just like plum cakes during this season. Last year I tried one of those carrot dates in the market and loved it. That's how I ended up baking this cake and am happy that I tried. I have already made this cake 3-4 times and last time I happened to take it home too. My cousins and parents just loved the cake. I thought to share this cake recipe before I move out on vacations and am glad I could make it.So if you are trying to bake something special this Christmas or wanna try a different cake other than Kerala plum cake(Christmas Fruit Cake) then this is a right choice. 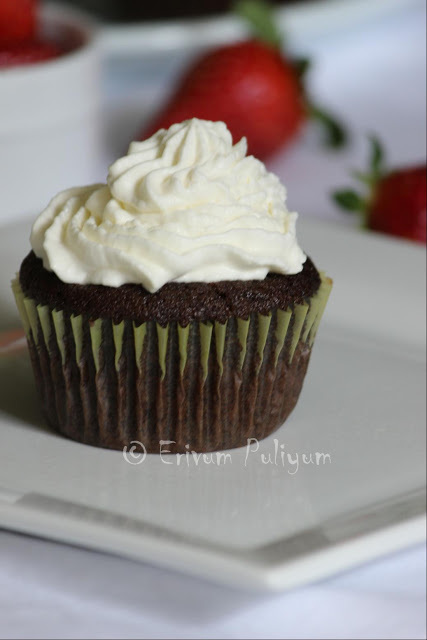 This is a butterless cake, so calorie conscious can also give this a try !! Sift the flour with baking soda and salt twice. Keep aside. Peel and grate the carrots, chop the dates after de seed, cashews and almonds chopped, leave aside. Pre heat oven to 350 degrees F or 180 degrees C.
Prepare the caramel by heating sugar in a pan. Wait till the sugar dissolves and starts to caramel. Switch off flame when sugar is dissolved completely and turns golden brown. 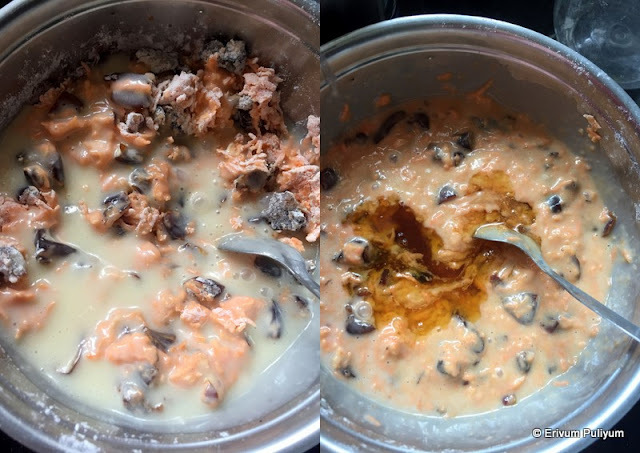 Add 2tbsp (1/4 cup)water to this and mix well( the caramel will be very hot,so be careful not to get burns). Beat the eggs with sugar using a beater or blender. The sugar should dissolve completely or powder the sugar and use( I have used 2/3 cup sugar only but you can go up to 3/4 cup). Add the oil to the egg- sugar mixture. The mix may look creamy now. Add in the vanilla essence and milk. Add the wet mixture to the dry flour mix in three batches until incorporated well. Add in the grated carrots, chopped dates. Mix well( the batter may look watery unlike the other cakes but don't worry, the cake sets as it bakes). Add in the caramel and mix well. Pour the mixture in a 8*8 prepared tray and bake in the oven for 35-40 minutes(mine got done at 35 minutes). Remove from oven and place on wire rack to cool completely. Cut and serve once its cooled (the top of the cake is sticky and the inside is moist so the cake can't be cut in clean slices). * The amount of sugar in the recipe was 3/4 th cup but I have reduced to 2/3 rd cup and that went perfect for my family as it has carrots and dates(both have sugar in it). 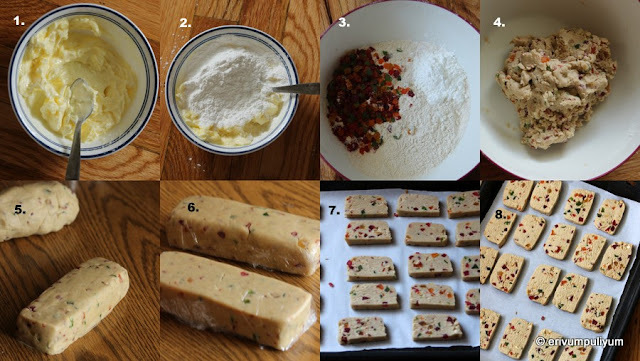 * I have adapted the recipe from here and the recipe uses cashews alone. I have used both cashews and almonds. You can use cashews or almonds alone. * The cake batter may look watery but don't worry the cake sets in as it bakes. 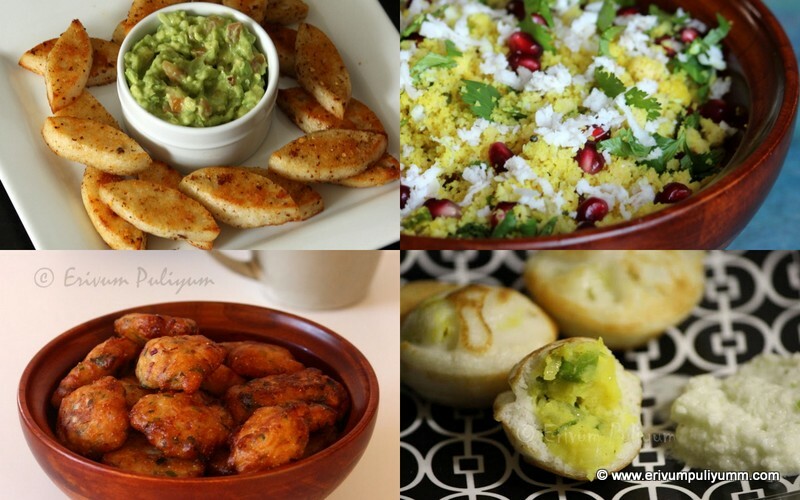 Nalumani palaharam (Tea time snacks) is a must especially on weekends when all are at home. These days acchappam or kuzhalappam / madura seva / murukku like fried goodies don't incite much interest in my family and their demand is for some filling snack like kozhukatta or ada or chats. But every other day the same things don't work good and am in search of more interesting snacks along with the regular ones. Then one day, H saw the bajji chilli in the super market and brought home. Here we don't generally find these chillies always and so hardly I prepare these at home. Long back, I had posted the plain mirchi (mulaku) bajji which doesn't have a filling. This time I prepared these with a filling which I liked more than the plain ones. My mom always remember the filled mulaku bajji she used to devour during her stay at Jodhpur. She misses having these north Indian snacks at times so do I. These are quite simple to make like pakoras and can be enjoyed with a dash of ketch up. Do try these ones !! Wash the banana pepper or bajji mulaku under running water. 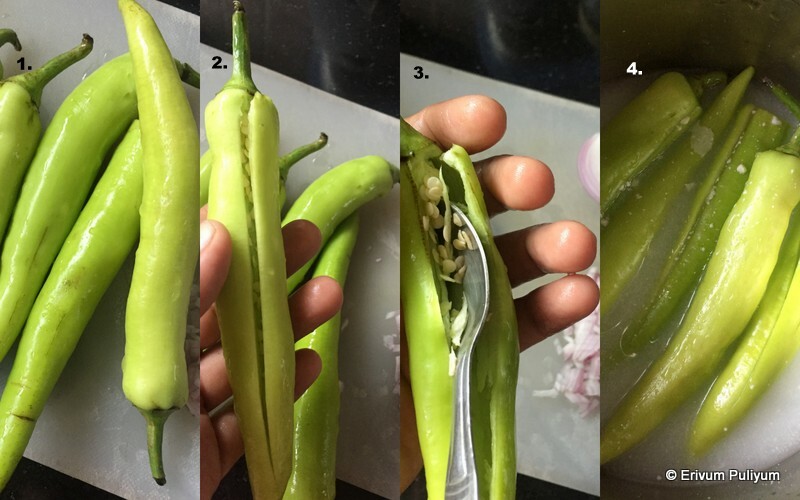 Then slit open the chilly(retain the stalk) and scoop out the seeds with a spoon (don't use hands as it may irritate the skin and feel burning sensation). Drop the chillies in a bowl of water with added curd/yogurt /tamarind pulp and leave soaked for 15 minutes( this is an optional step but it reduces the spices considerably). Heat a pressure cooker and add the potatoes,salt and turmeric powder for three whistles. Once the pressure is released, remove and mash the potatoes well. To this add the chopped onions, chilly powder, amchur powder, roasted cumin powder, cilantro chopped and salt. Combine this mixture well and keep aside. In another bowl, mix the besan(kadalamavu), ajwain seeds,chilly powder, kayam podi(asafoetida) and salt. Make a thick paste by adding water little by little(don't make the paste very watery else the chillies may not coat properly. Now, carefully remove the soaked chillies,wash under running water(drain the water completely else the filling may become watery when filled). Spoon each chilly with the potato mixture to fill completely. Keep aside. Heat oil in a wok or kadai and wait till its hot enough to slide in the chillies. In the meantime, add the pinch of baking soda to the kadalamavu(besan ) batter. Mix well. Drop each filled chilly in the batter. Coat all the surfaces nicely and then drop the chillies one by one to the hot oil. Lower flame to medium so that the chillies get cooked properly on all sides. Drain using a slotted spoon once the chillies turn golden brown. Place on a paper towel for 3 minutes and gently move to a serving plate. Serve hot with tomato ketchup and with a cup of garam chai(tea). Repeat the above step till you finish frying all chillies. Drain on a paper towel and serve hot. * Besan tends to form gas and cause acidity. Adding ajwain or ayamodkam reduces the chance of acidity, you may or may not add depending on personal preference. * I have gone low on chilly powder as kids don't eat very spicy but you may add more if you like it spicy. * You can skip ading the chillies in tamarind or curd if you don't wish to lose the spiciness. When you have two contrasting foodies (esp kids) at home and each having a unique taste then the real hard work of mom is to please each one in her own way. My elder one loves 'erivum puliyum' or rather chatpata flavors at the most and younger one loves sweet flavors the most. However the younger chap also loves bitter gourd which is all the way contradicting(still cracking heads to understand his tastebuds). When it comes to packing food for lunch,each has a new menu ready satisfying to their tastes. However, I do make a balance in their menu and wrap up my own variations to please both. They both unanimously nod a 'yes' to very few recipes and this baby corn stir fry is one such healthy recipe. Now, that its lent time for Kerala Christians and I think many may be in a hunt for vegetarian recipes. So,this may be a yummy side dish for one of these nombu (lent) days. Baby corns are easy to cook and there are a number of dishes that can be prepared in no time with this versatile vegetable. 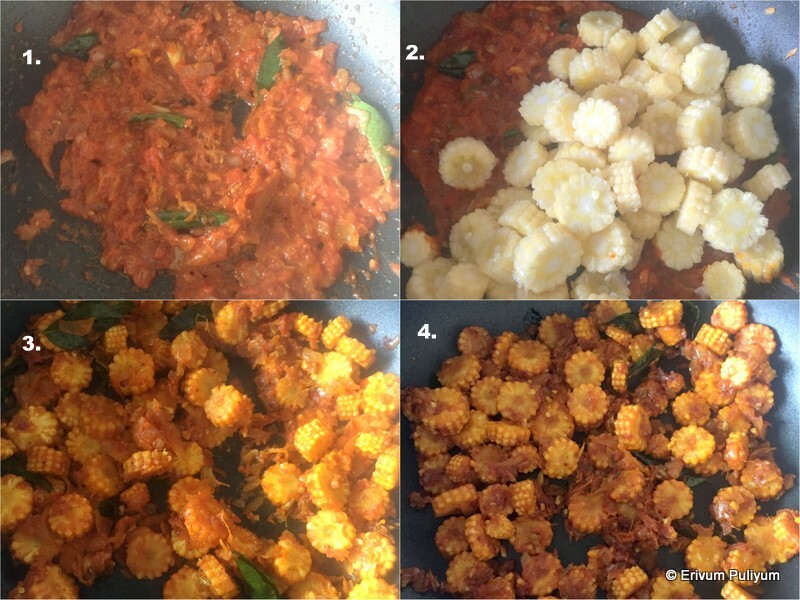 I had earlier posted baby corn butter masala which pairs perfectly with chapathis/rotis / naan. Baby corn 65 is another simple appetizer and tastes yumm when served hot. 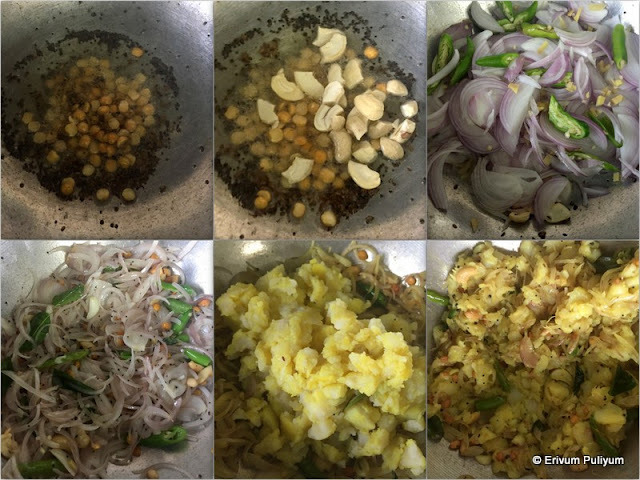 This is yet another simple and healthy stir fry that can be prepared in a jiffy. Do check this out !! Wash the baby corn under running water ,drain and keep aside (don't leave the baby corns in water as they tend to soak up water). Cut in small roundels after snipping off the top and bottom portions lightly. Add the chopped tomato in a blender and blend till smooth.Keep aside. Heat a pan and add oil. When the oil is hot add perinjeerakam(fennel seeds), let it sizzle. Add in ginger garlic paste and saute till raw smell disappears. Transfer the fine chopped onions and saute lightly browned(add a pinch of salt to speed up the process). Then add the spice powders on low flame and then add tomato pureed. Give a quick mix and saute till the tomato paste is well cooked and the gravy is thickened. Add in the cut baby corn and salt, give a quick mix. Lower flame on low and cook covered for 7-8 mins, in between give a stir just to ensure there is even cooking. Open the lid and add in a tsp of oil. 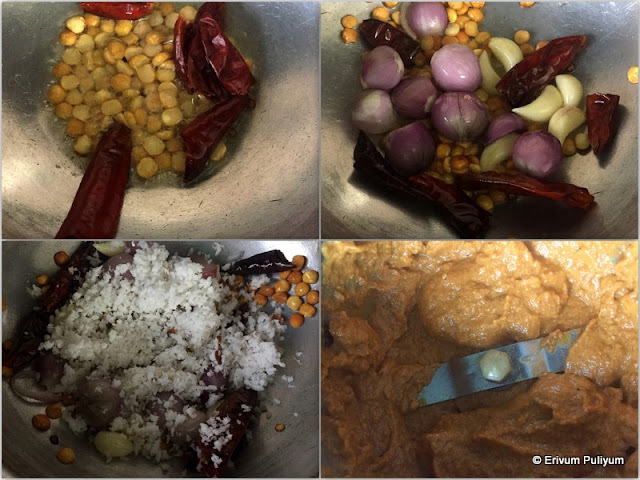 Increase flame to high and dry up the moisture left behind and the masala is well coated with the baby corns. Switch off flame and serve warm with rice. How do you quench the thirst on a hot summer day? I prefer to sip a lemonade to calm down the heat or sip a sambaram/ pachamoru (spiced butter milk) which perfectly eases the thirst. These are natural cooling foods that you can easily give a try and you regain the energy instantly. Watermelon and cucumbers also can be added to cool your body. Kids love lemonade better than sambaram but H likes sambaram over lemonade. Lemonades can be made by adding a variety of fruits or with simple lemon alone. I try out with different flavors of lemonade at home as kids also prefer to try out varied tastes and flavours.Passion fruit lemonade is one such experimentation which all liked because of the vitamin C packed tangy flavors at te first instance and the added crunch of the seeds too. If you are a person who don't prefer that added crunch of seeds in the lemonade then you can blender the pulp in a blender,strain and discard the seeds. This is a simple lemonade but I truly love the color of this lemonade. To make sugar syrup: Dissolve (1 cup)sugar with (1 cup) water. Boil this mixture over low heat until the sugar is dissolved completely, Switch off flame and leave to cool. Refrigerate to cool or preserve for later. Wash and cut the passion fruit in halves. Scoop out the pulp using a fork keeping in mind not to remove the white thread like strings attached to the pulp. 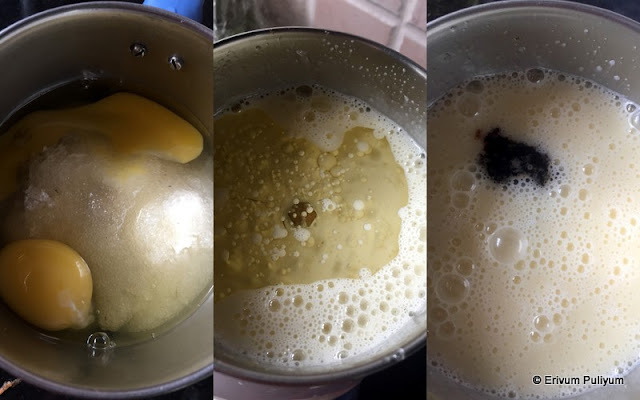 Remove in a glass or jar and beat/mash lightly using a fork(Its better not to use the mixer to mash the passion fruit pulp as the seeds gets ground or incase if you wish to use the blender,then just pulse once or twice). Mix the sugar syrup with the passion fruit pulp well and enjoy with ice cubes or just like that or chilled. * You can use make bigger batches of sugar syrup to make more lemonade in the ratio of sugar and water 1:1. Hope you all are doing good !! Its been quite some time since I posted something here. Nothing to blame for the absence this time just my lethargy and mood swings. It takes a lot of energy to overcome the inertia set in, Right? I wasn't active in fb too,just thought to give everything a break for a while until today. Its like as if I was cut off from the whole world(missed so much reading) once you stop seeing fb posts for 2-3 days, Do you also feel the same or if it's just me? Anyways, coming back to today's recipe is a pickle made from dry mango pieces. When you have mangoes in season, Keralites generally preserve mango slices so that it can be used throughout the year in various forms. I have been making these dry mango slices since two years now as we have plenty of mangoes in our home during season. The sour type and thick fleshy mangoes work perfect for sun drying. The mangoes are first washed and if the skin is really hard,you can just peel the skin off or else just use as it is. These are then sliced in thin pieces,add enough salt. Mix and leave for one hour. The mangoes leave out water, then layer the slices on clear plastic sheets for sun drying. They tend to stick to the sheets but don't worry they will just start to peel off as it dries better. Two to three days of good sunshine is enough to sun dry and preserve them for a year. Store once all pieces are shrinked, dried well and they become hard. I have already tried this recipe 3 times in these two years and each time there was good response.The large pieces curl like snail and shrinks in size as it dries. Whenever you wanna use them for curries, aviyal or chutneys just soak in water for half an hour and use them. Today's post is a very addictive pickle made with these dry mango pieces. This recipe is adapted from Lekshmi Nair's show where she visits a mana and the residents of the mana explain her the procedure of making this manga achar. 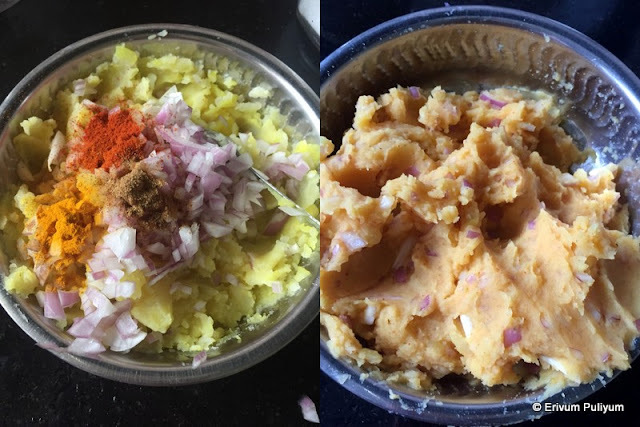 They run a small scale unit from home and I found it interesting to taste test by preparing at home which was a real good try.Everyone loved it at home, its quite different fro usual pickles and tastes really delicious with curd rice and other Indian staples. It has a definitive balance of sweet, sour and spice flavors and the mango pieces attain a real softness when mixed with gingelly oil and jaggery syrup. Do give this a try if you have dried mango pieces at home or bookmark it to try for the next mango season. Melt the jaggery in a cup of water and strain to remove impurities. To this add the chilli powder, uluva podi(fenugreek powder), corainder powder. In a pan heat the gingelly oil. Add the asafoetida powder or kayam podi when hot. Switch off flame and add to the previous mixed jaggery. Mix all the spices well and add the ada manga(dry mango). Ada manga has salt in it when dried so add salt accordingly. Keep aside for 2 days, in between just mix the spices well with the ada manga. After two days, you can see that the water content is completely absorbed and the ada manga is well coated with the spices. Spread on a plate and sun dry the ada manga till its well coated and dry(it shouldn't have a sticky coating). Store in air tight containers and serve with curd rice. 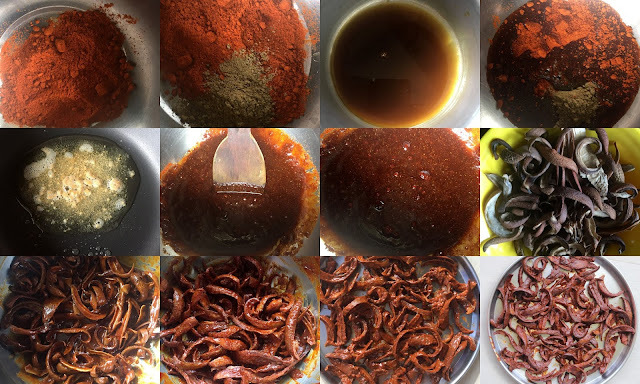 * I used piriyan mulaku podi(chilli powder) for the color but you can use any other chilli powder/kashmiri chilli powder but if you are using any other type of hot chilli, reduce the amount of chilli powder accordingly. 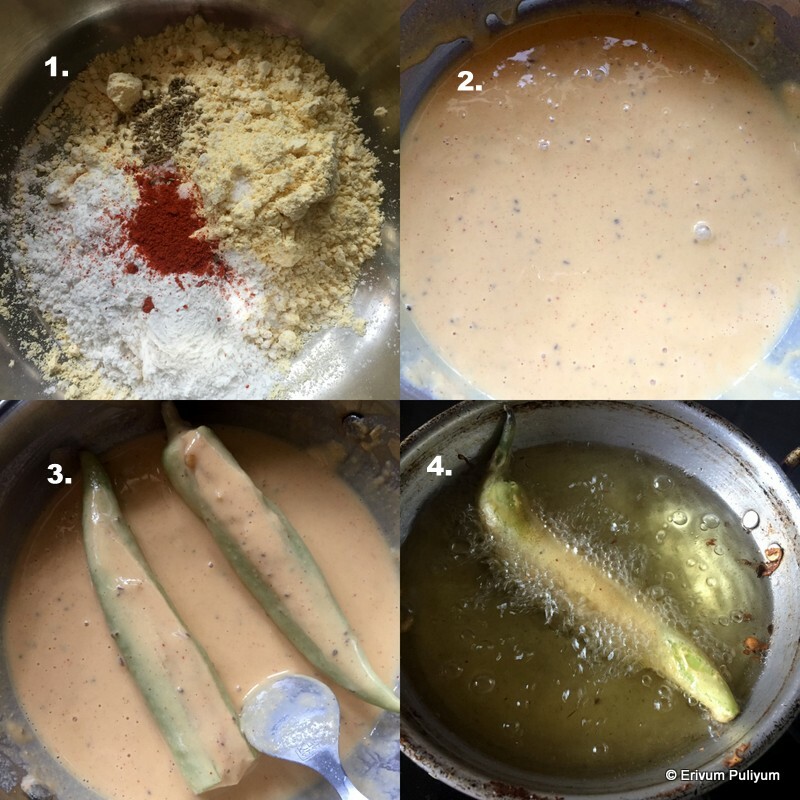 * This recipe is adapted from Lekshmi Nair's show where she visits a mana and the residents of the mana explain her the procedure of making this manga achar. 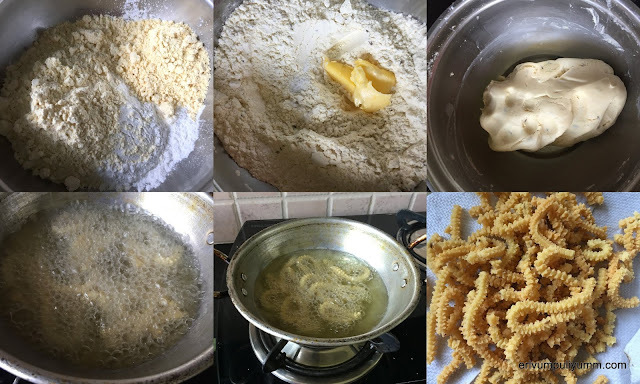 They run a small scale unit from home and I found it interesting to taste test by preparing at home which was a real good try. Pottukadala murukku or split dalia murukku is an instant snack that you can prepare in a jiffy for tea. There is hardly any hard task and can be prepared by anyone. The split dalia needs to be powdered smooth and mixed with rice flour and besan. Butter is added to enhance the flavors and so kids call this as 'butter murukku' too. 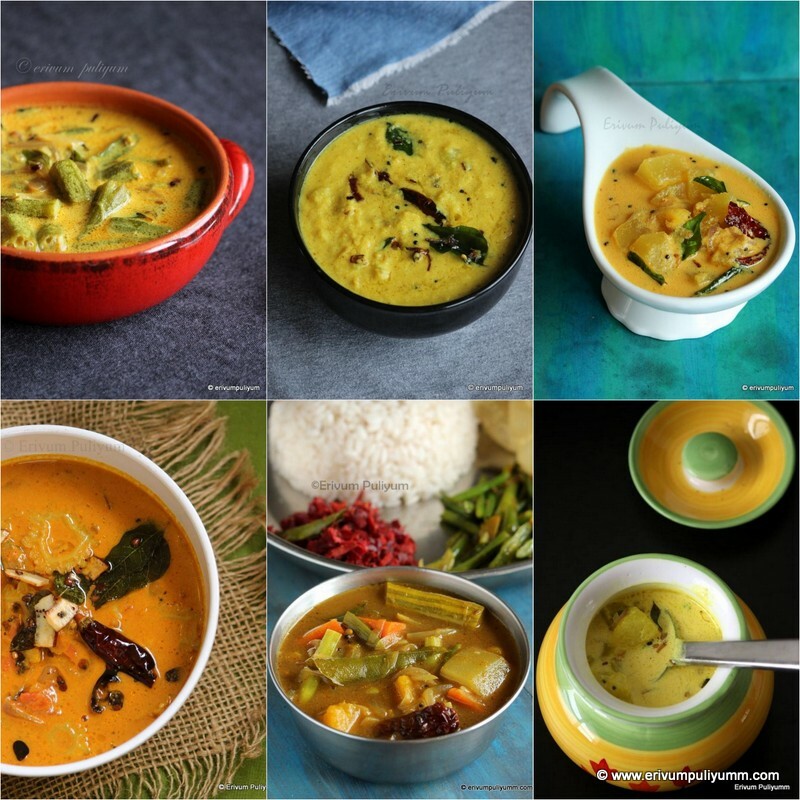 I happened to view this recipe in a cookery show and loved the simplicity of making unlike the other mullu murukku. These are crunchy,crispy and quite addictive too, perfect to go with a hot cup of tea!! Powder the split dalia(pottukadala) in a mixer. Sieve the powder smooth. Then take the rice flour, besan and split dalia powder in a bowl. Add the jeerakam(cumin seeds),asafoetida powder(kayam podi) and salt. Mix well. Add softened butter to this and mix with hands to get a crumbly texture. Then add water little by little to knead in a smooth soft dough. It should be loose than chapathi dough. Leave for 10 minutes covered. In the mean time,heat oil in a kadai and in a idiyappam press or mould attach the star plate and fill the dough in it. When the oil is heated enough, press the murukku directly holding over the oil. Flip and turn both sides and cook on medium heat. Don't get this over browned(doesn't taste good) and drain from oil as the pieces gets crisp and light browned. Cool completely before storing or enjoy with tea. * 1/3 cup of split dalia will yield 1/2 cup of split dalia powder. 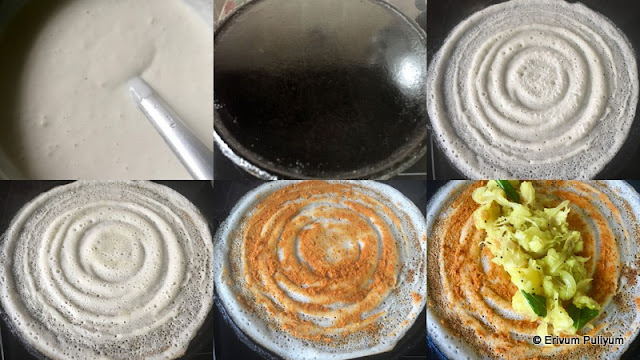 * Roasted or unroasted both rice powder (appam/ idiyappam flour) works good for this recipe. * You can add a little spice too if you like it that way, either pepper powder or chilli powder 1/4 tsp can be used. * Wait for the oil to be hot before making each batch as murukku soaks more oil if oil is not heated good. Drop a lilttle piece and check if the little piece pops up on the surface of oil then oil is heated good.